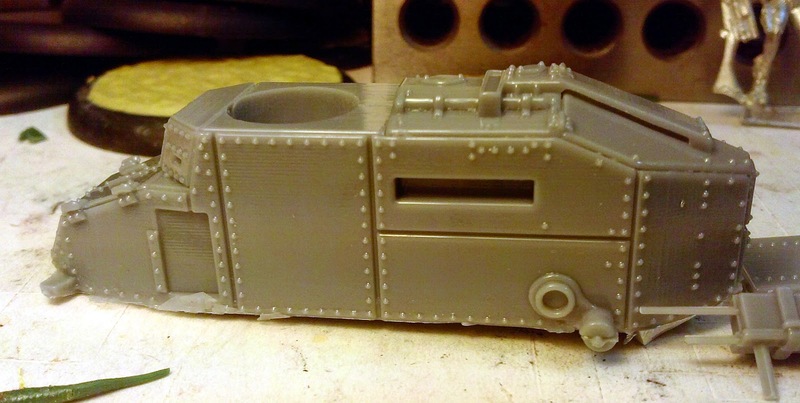 There are three Trenchworx FT-17s in my box that could see almost immediate use so, of course, I decided to assembly the armored car first. 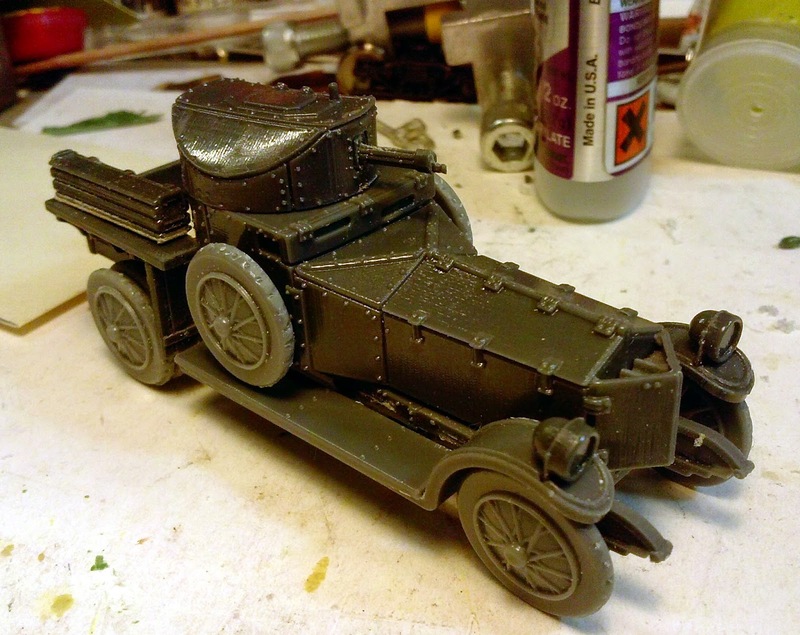 I think because I find it to be a fascinating vehicle and I think I'm going to use it as my vehicle entry for Genghis Con in February. 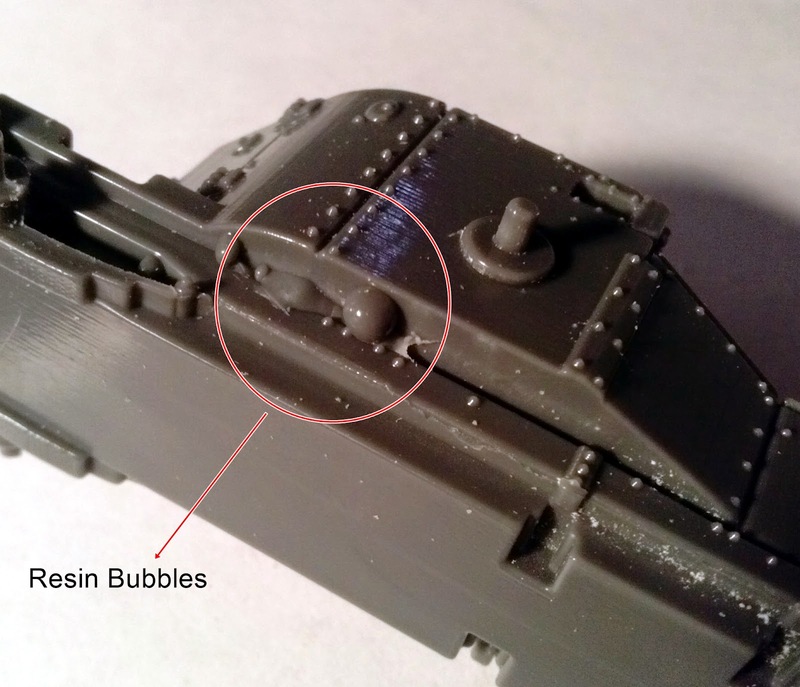 There are a fair number of parts to this resin kit so I thought it might be useful to explore the does and don'ts of this particular kit. 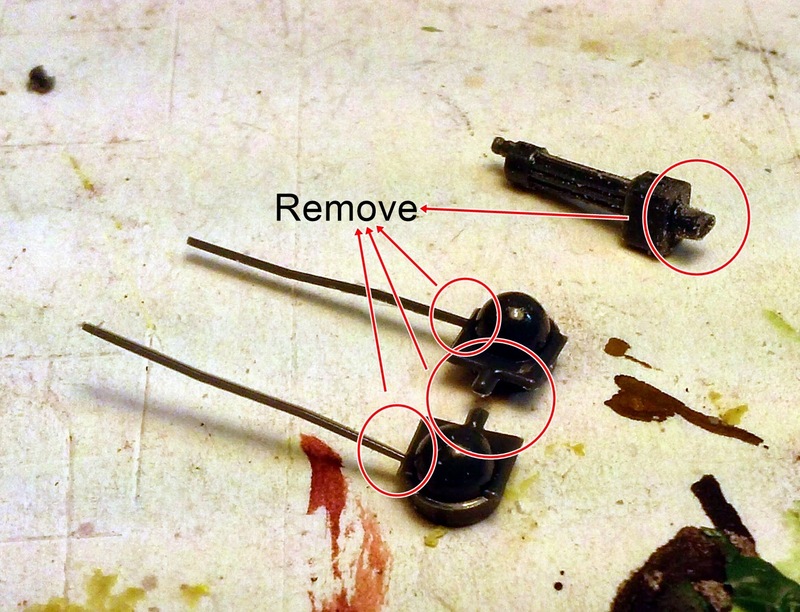 If you have been a regular reader of my blog then you know that I prefer some kind of instruction with almost any kit regardless of how simple it should be to put together. 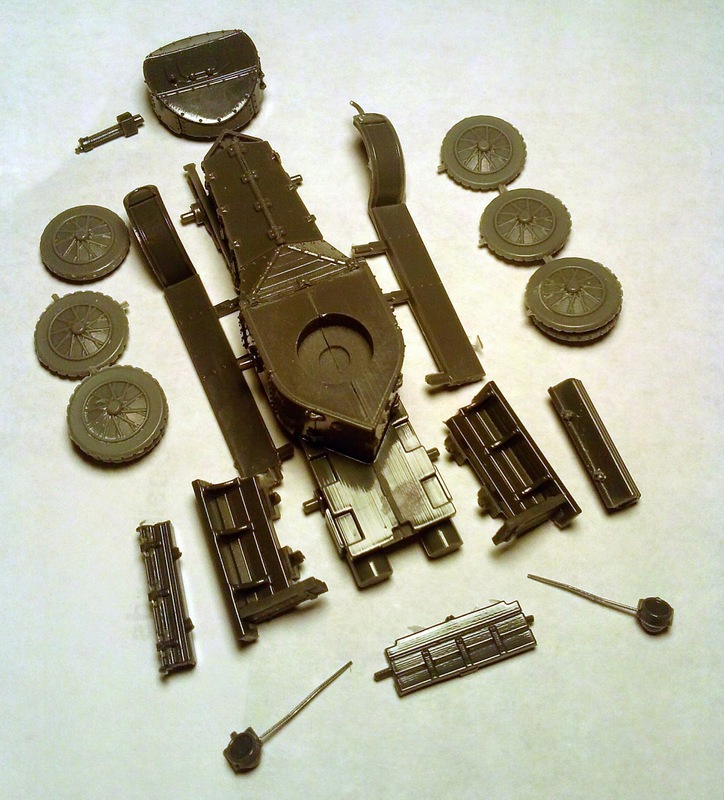 What is intuitive to the kit designer is not always immediately apparent to the builder. While there are some excellent photos on the Trenchworx website there are still a few question marks on how things really should fit together. 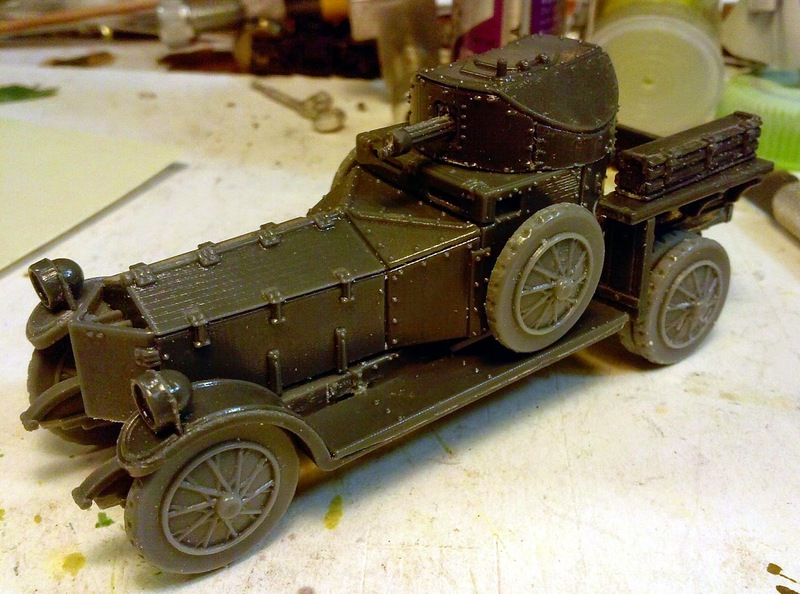 Let's go through the initial pictures of prepping the vehicle for assembly and I'll try and point out some of my mis-steps in building this kit. 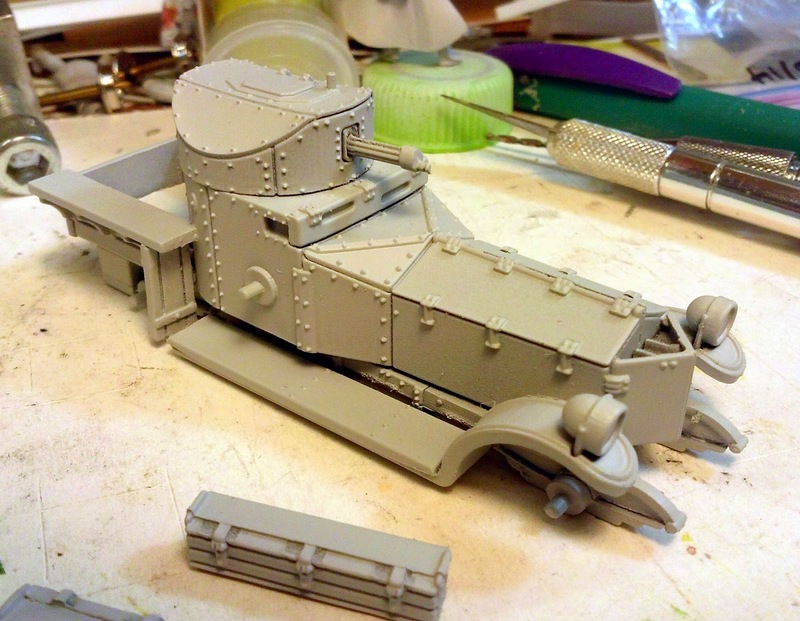 While getting ready to put this together you will really appreciate the detail on this armored car. 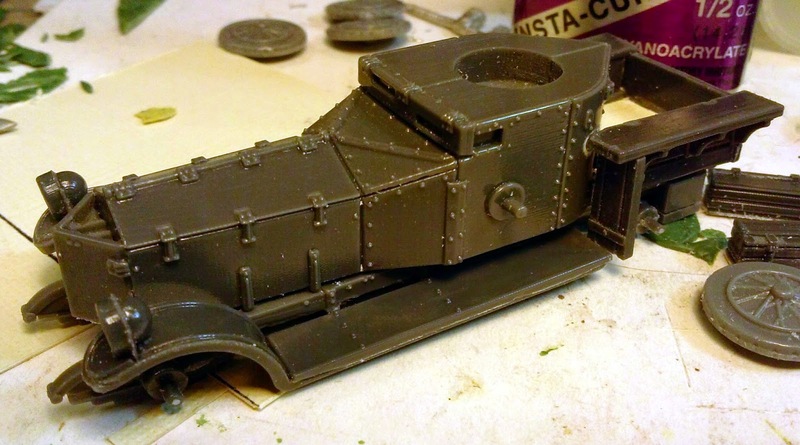 I went out and found a lot of pictures on the web for reference (watch your dates though, this vehicle saw service up through the opening days of WWII) and Trenchworx did a great job capturing it in miniature. The only thing I could really wish for right now is real spoked wheels. I'll have to keep my eyes out for likely substitutes. Oh and if anyone actually finds a picture that shows the floor in the back bed I would appreciate a link to it. Anyway on to the pictures. Laying out the parts in an "exploded" format. Turrent and MG at the top. Wheels on the outside then the fender/running boards and the chassis. In the back are the storage boxes and the components that make up the rear bed. 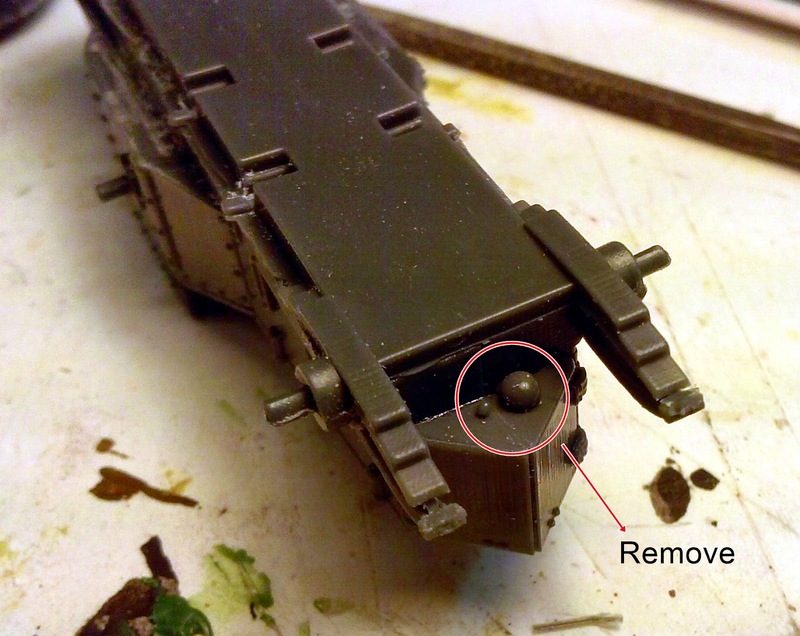 Finally what I thought initially were antennas of some kind are actually the headlights and should be up at the top. 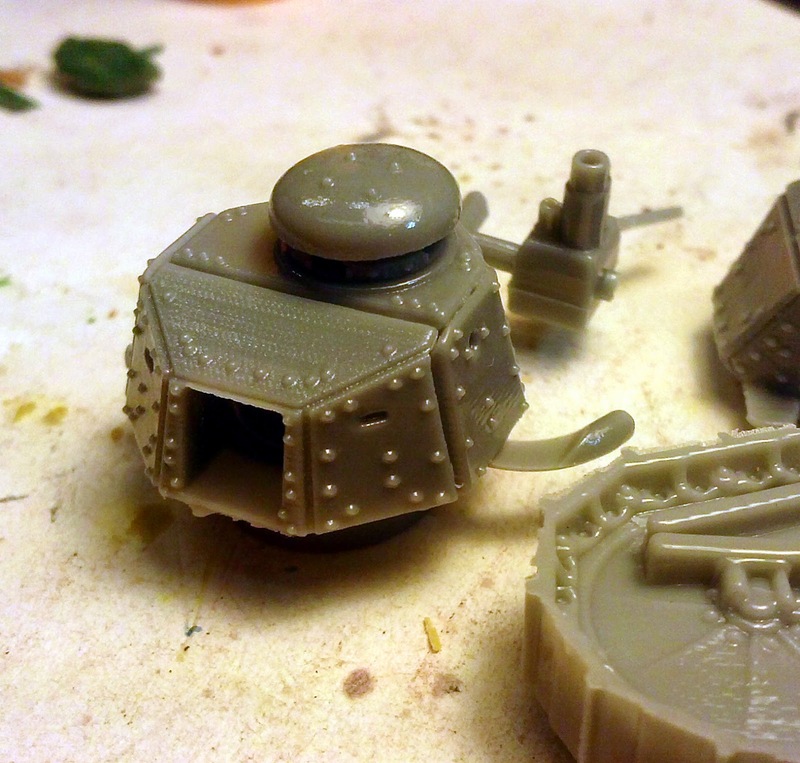 The parts from a slightly different angle, showing off the detail better. 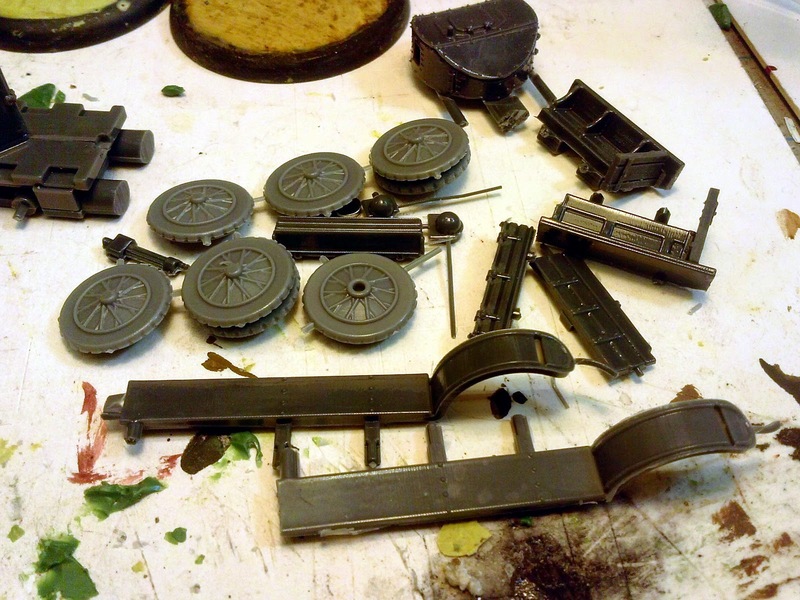 A wheel sprue, looks like the mold slipped a little on this, that's not flash on the edges. 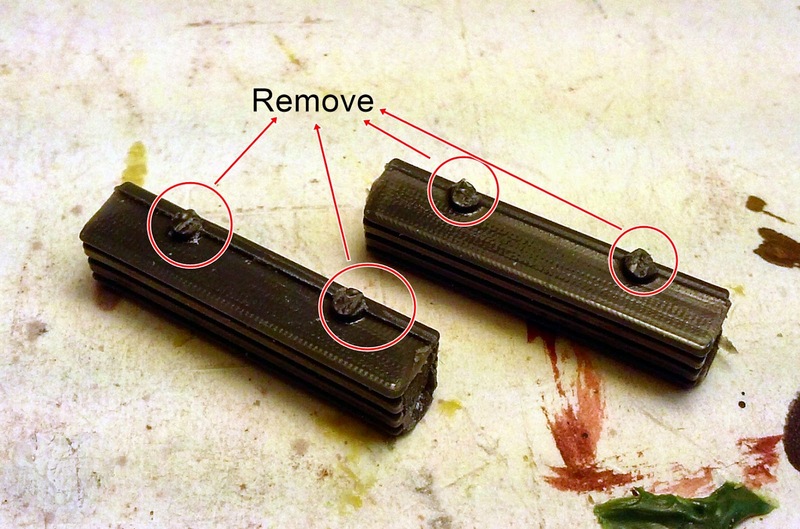 Nothing a file won't fix but you may have to score the tread pattern back into place. Here are the fender/running boards. 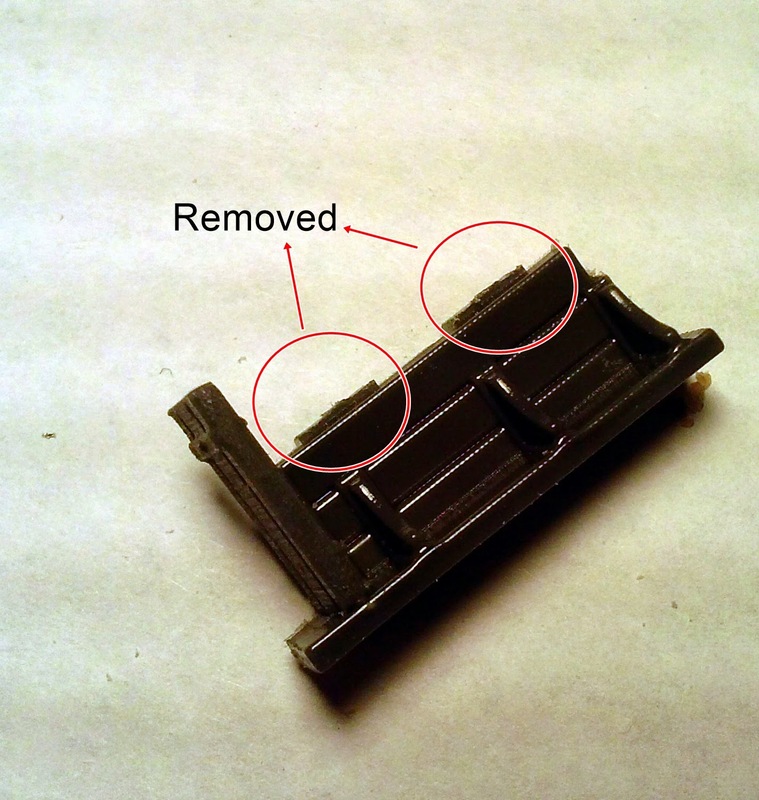 And while it was fine to clip the sprue bits off, I also removed what I thought was sprue off the locator pins. I should have dry fitted first then clipped. 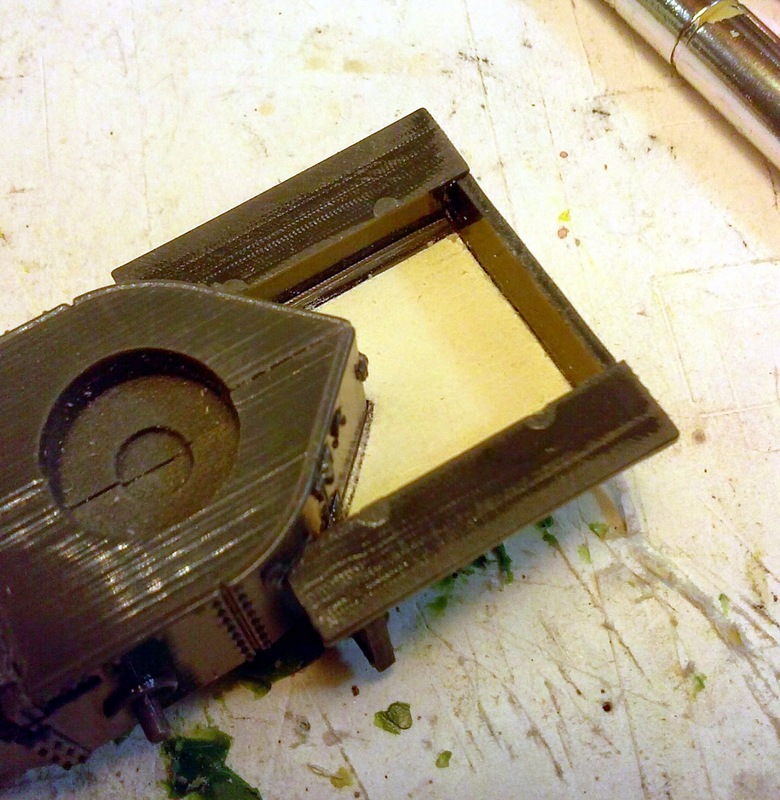 While I have enough pin to hold it into place its going to be a weak point on my model. Fortunately since this will be a contest entry its not going to get handled that much. The side bits for the bed in the back. 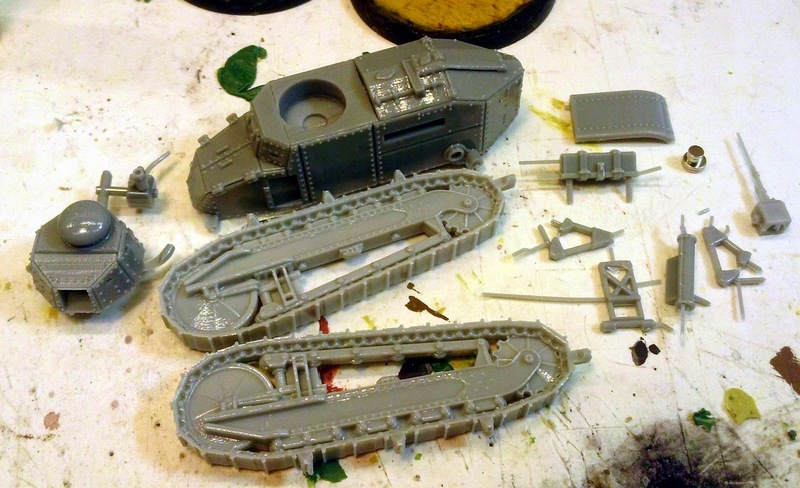 Two bits of sprue here. And easy enough to clip off. There are two of these pieces. I went in with my clippers, a razor saw would have been a better choice. I though this might get hidden but after looking at various pictures on the Trenchworx site and on the web this is a pretty visible area. I'll have to do some filling to make it look nice again. 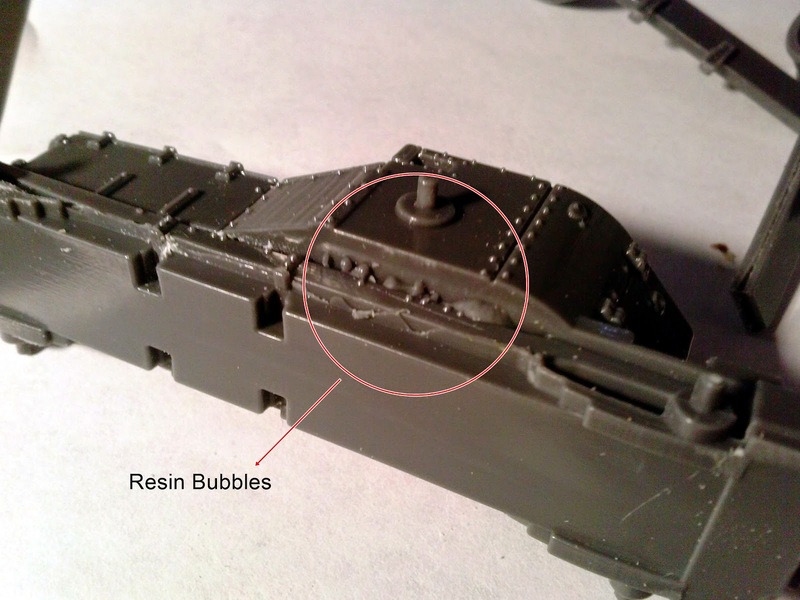 I found some resin bubbles underneath the chassis while I was filing off a mold line. 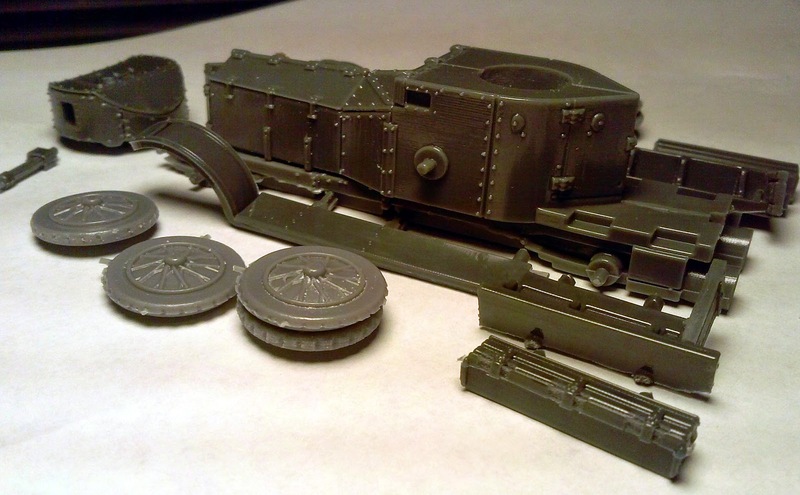 This is very much out of sight and you don't need to worry about it for a gaming piece. I'm going to remove them since its a contest entry and I'm not sure right now if the extra stowage is going to hide it or not. And more on the other side. 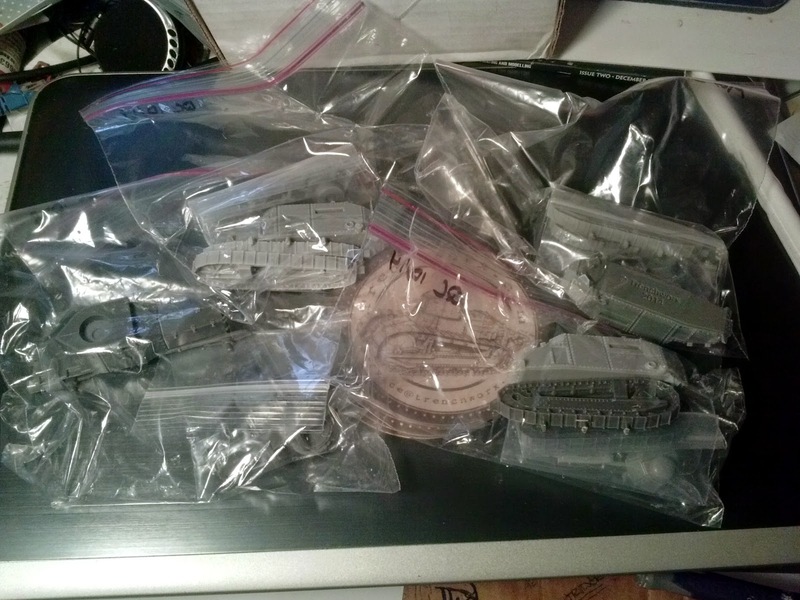 Sprues on the storage boxes need to be removed. 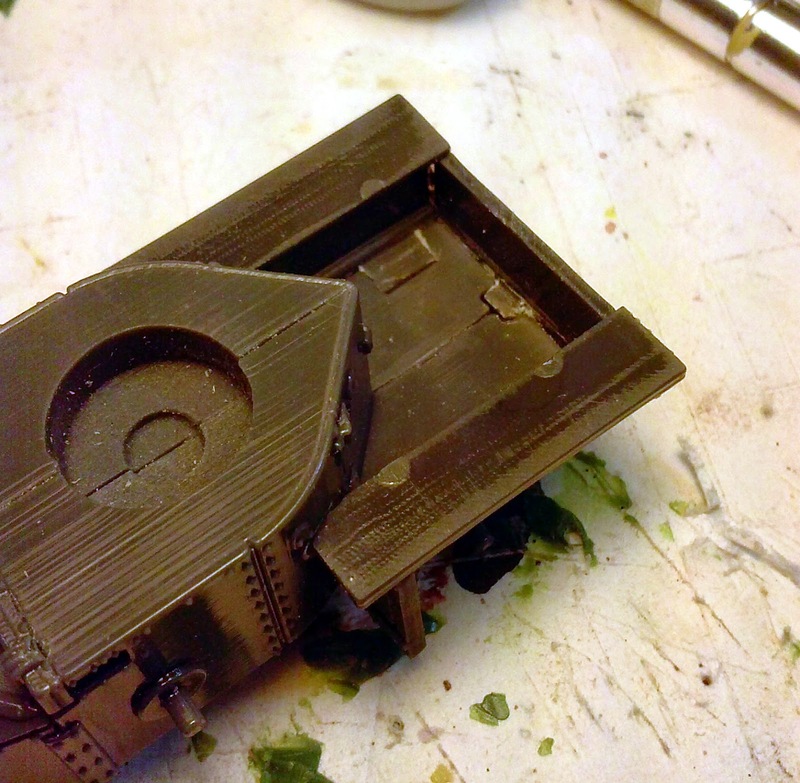 The turret has three big sprue channels on it. 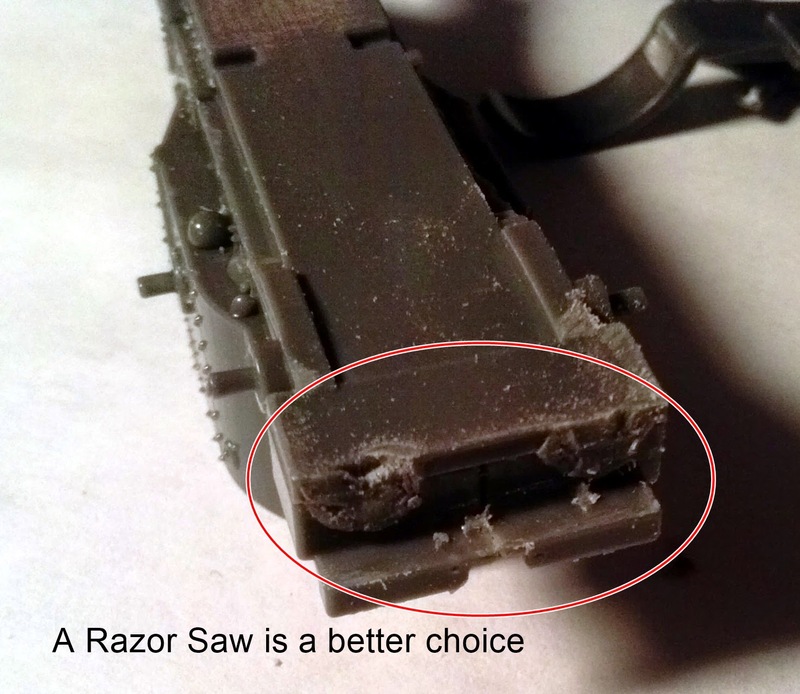 I used my clippers to remove most of the material, a final filing is required to get it smooth. The axles are a little long. 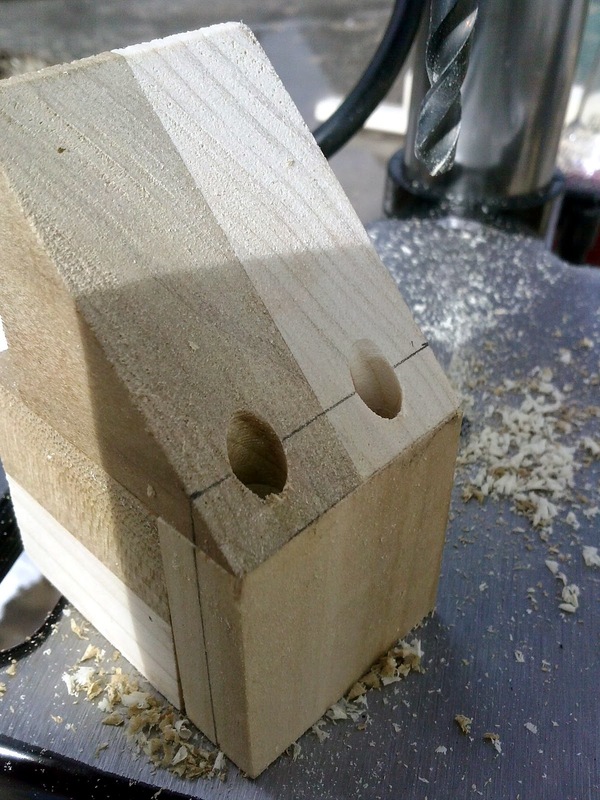 Rather than clip them shorter I decided to deepen the holes with a drills instead. 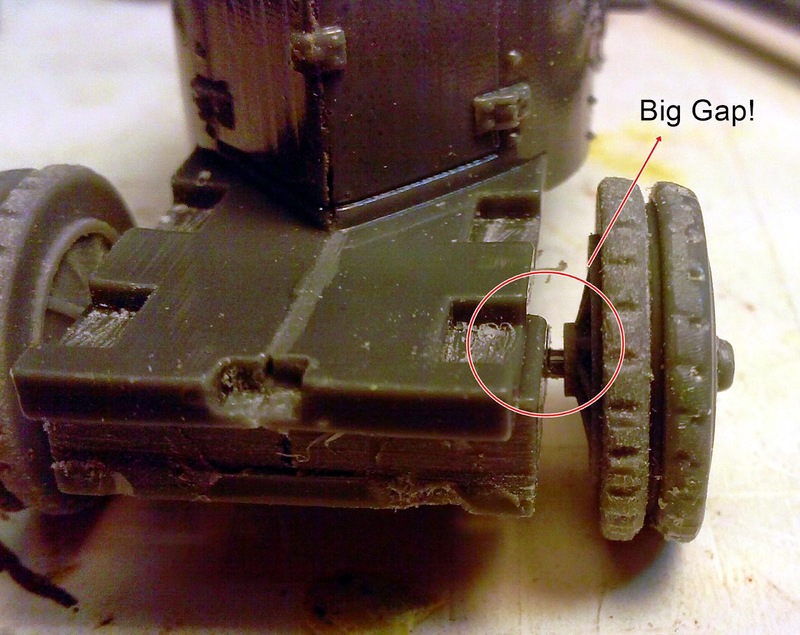 The axles on the rear could stand to be thicker. 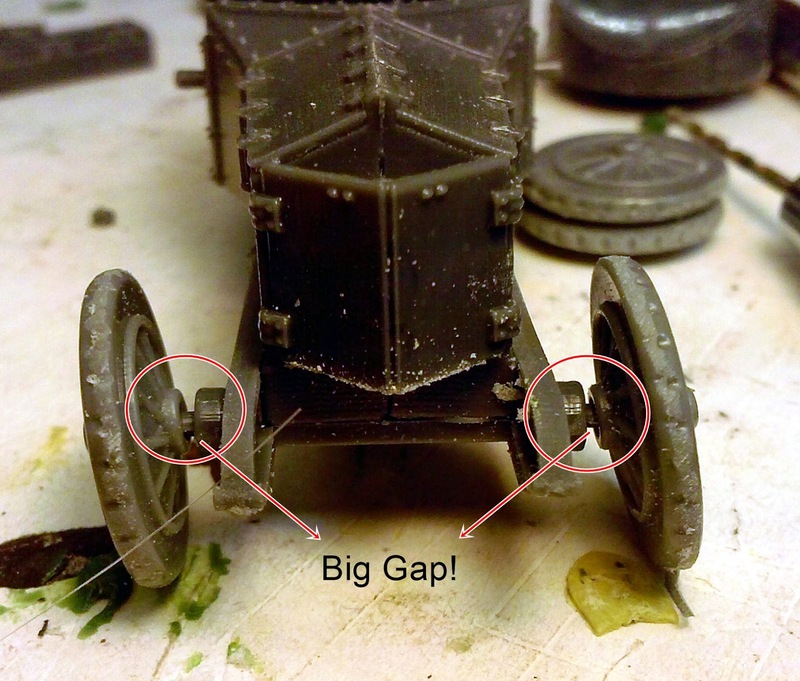 And the same gap appears on the front wheels. Same deal, drill the holes in the wheels deeper. You will need to do this for the spare tires as well. Dry fitting the back. The tabs are taller than the floor. I filed the tops down so that the floor will be level. I decided to use a piece of heavy paper as the floor. 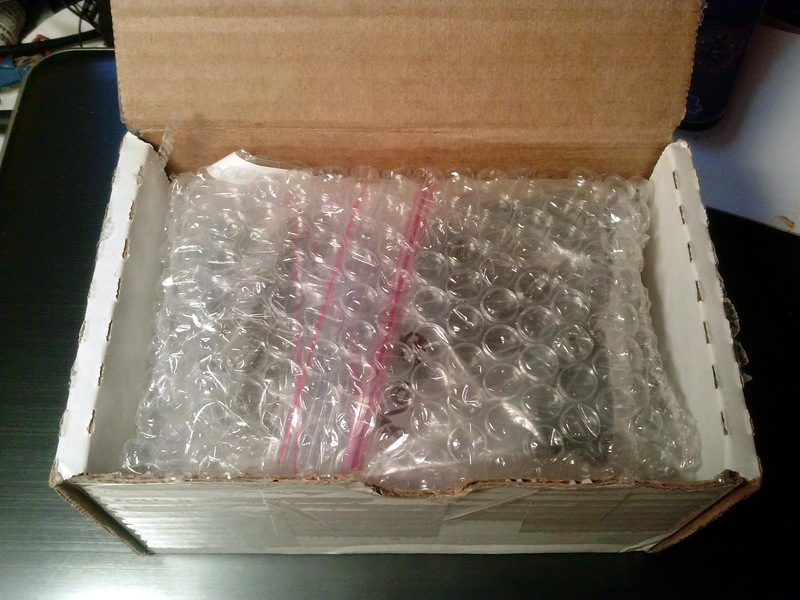 Mostly because I didn't have any thin plastic at hand. 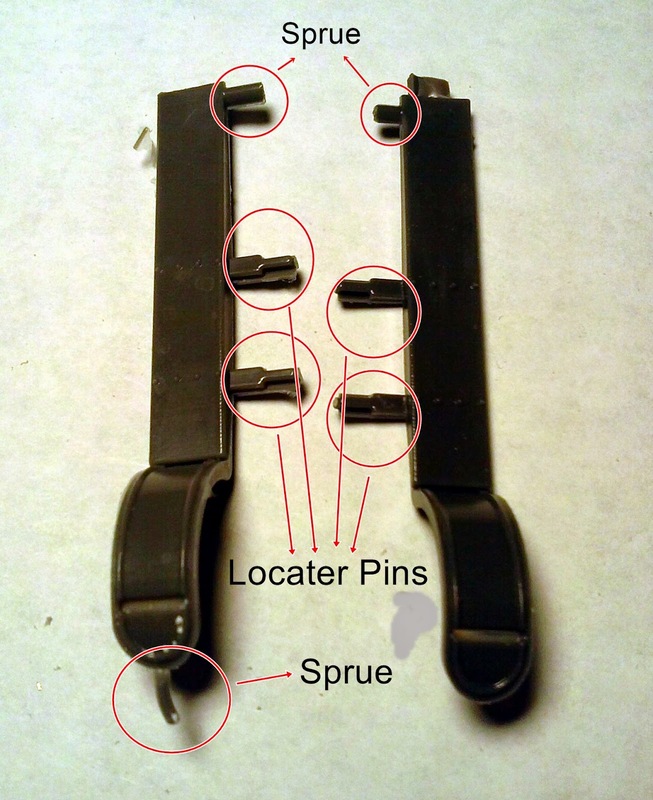 The locator tabs filed down flush with the bed. 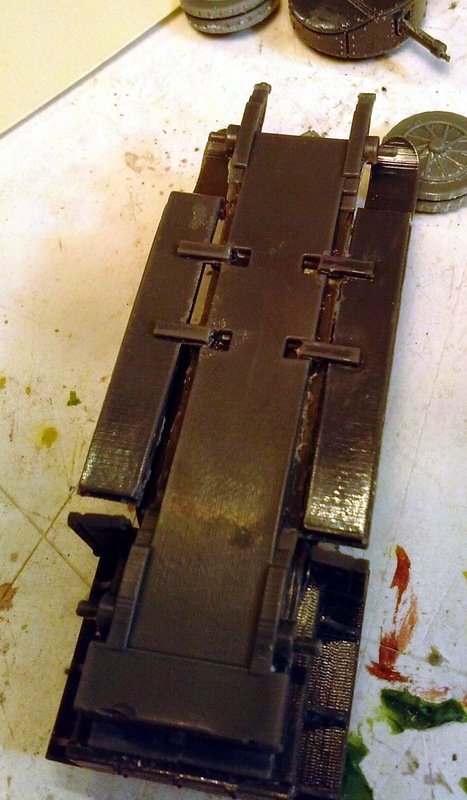 And gluing down the new "floor"
Getting the running boards in place was painful since I cut to much off the pins. 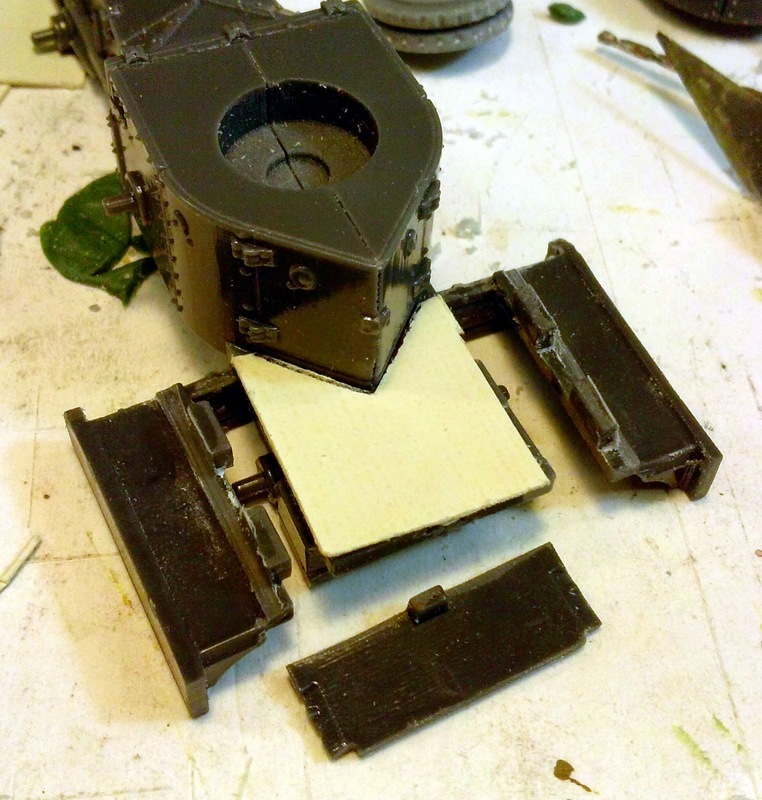 Remember dry fit the components first before cutting! Really starting to come together now. Here I have "dry" assembled the Rolls. 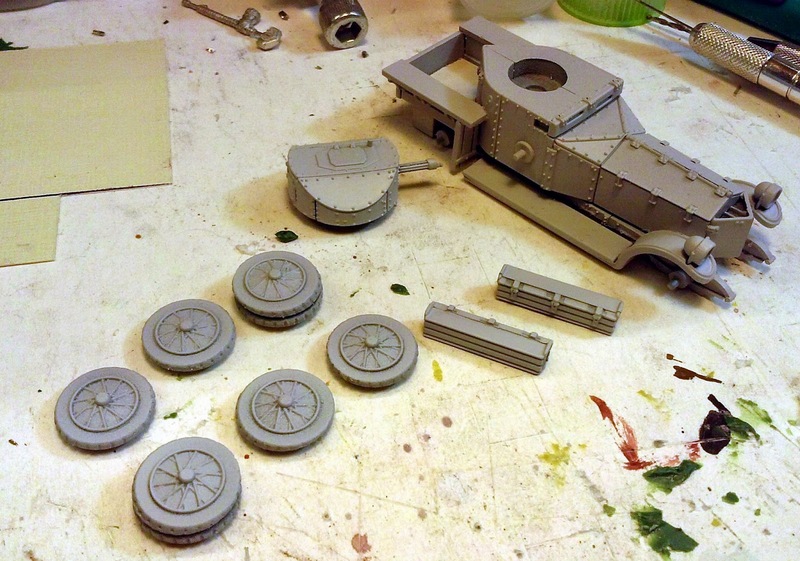 I won't glue the wheels or the storage boxes into place until after priming. 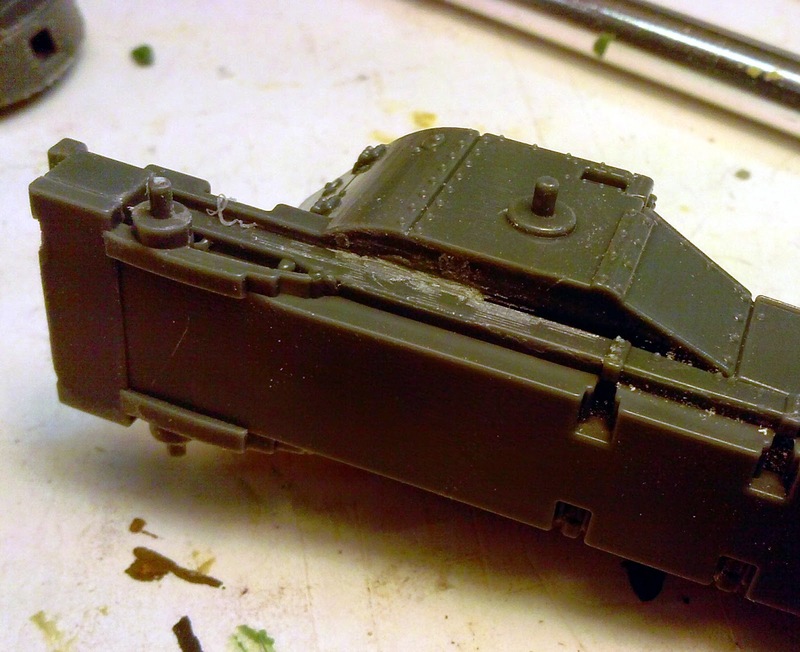 The wheels may not be glued on till the paintwork is finished completely so I don't miss anything. 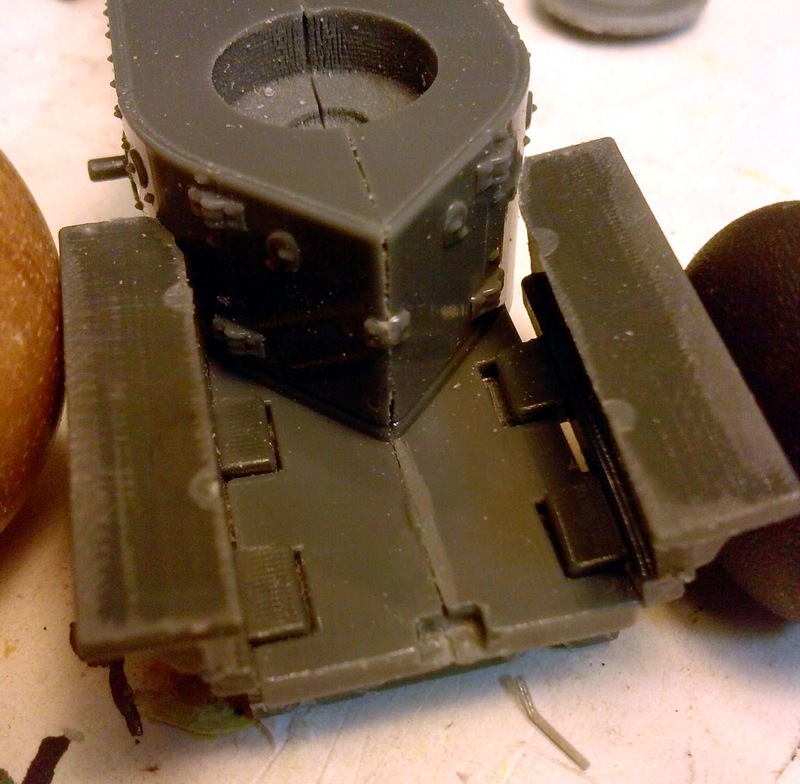 And a quick look with the turret in place. Looking good! 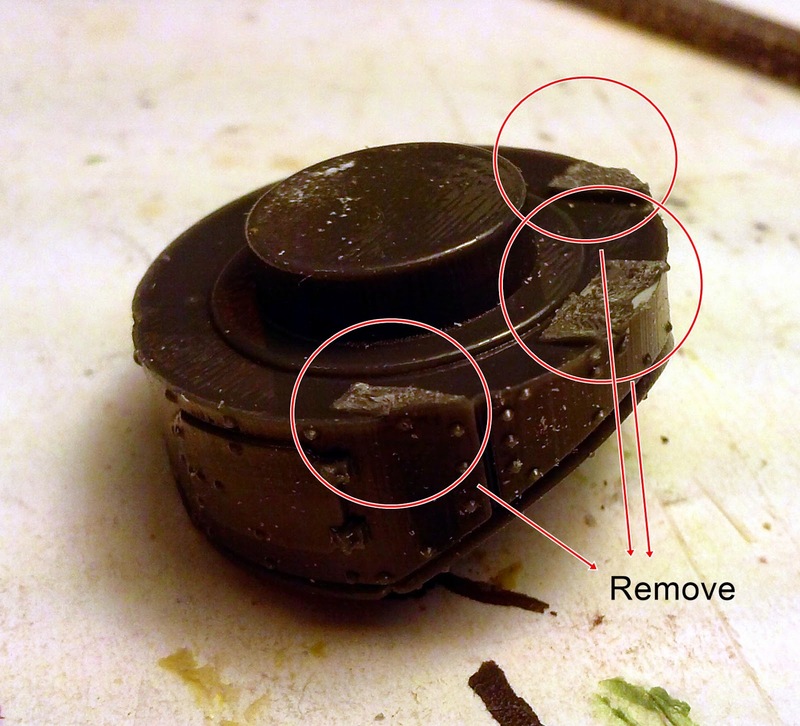 If you were concerned about the 3D printer marks that can be seen on some of the components don't be. I had not problem covering them with the primer. 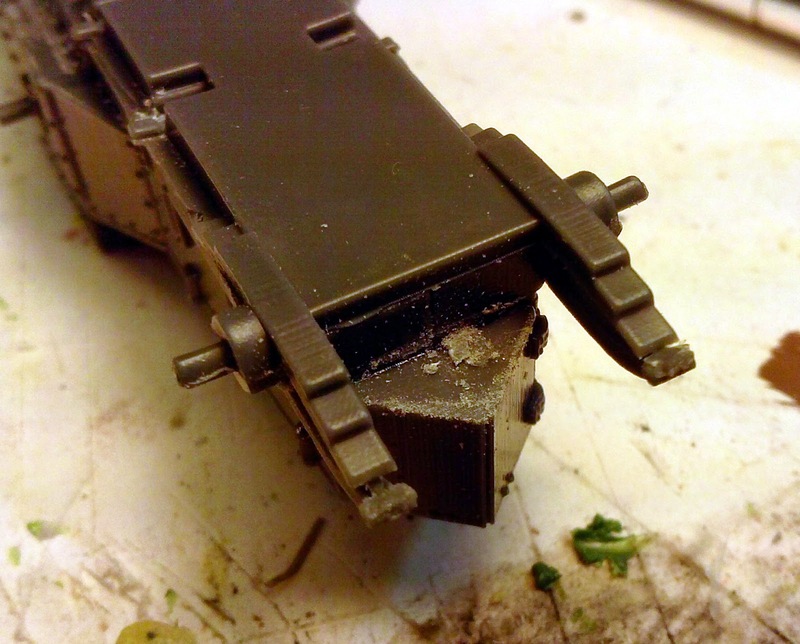 The parts really do have a very nice smooth finish to them. 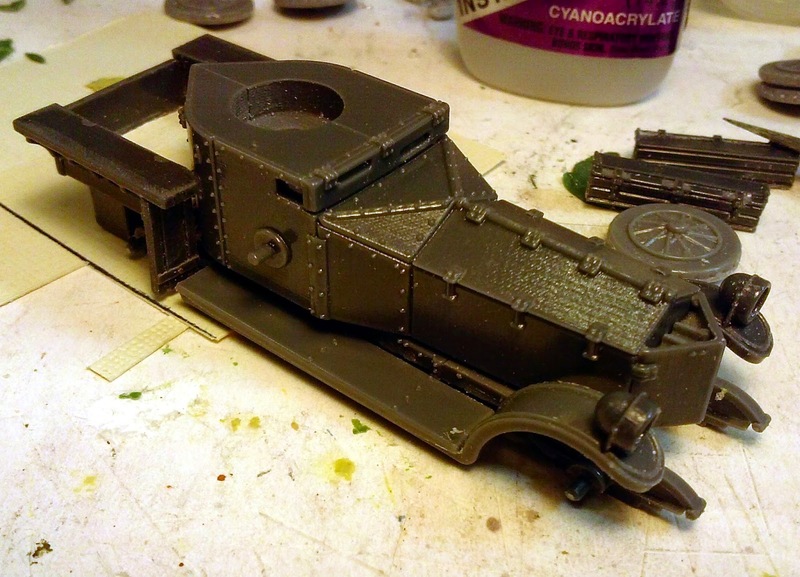 I will let the primer dry at least until tomorrow. 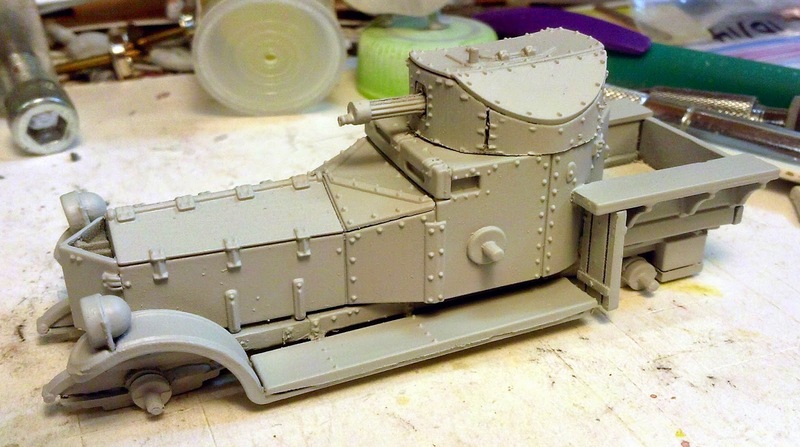 I need to decide if I want to paint this up as a desert vehicle (Lawrence used these to great effect in his campaign) or western front vehicle during the early mobile phase of the war in 1914. I found a really nice three tone camouflage scheme that was used. Maybe I should just buy a second one and do both. I do recommend going out and doing some quick research on the net on this armored car. There are some fascinating variations that could be done. What I would really like to find are some replacement wheels that are actually spoked. I'm heading to Colpar Hobbies tomorrow I'll have to check to see what they have that might work. 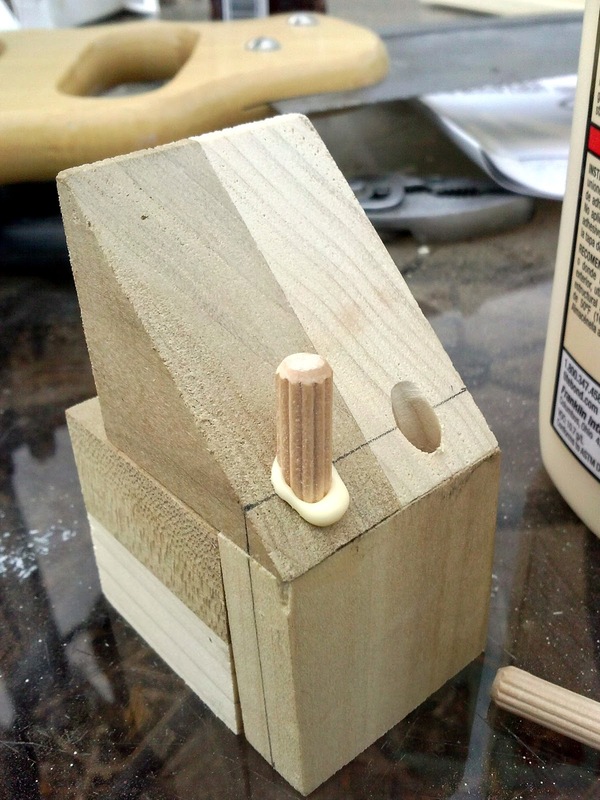 I hemmed and hawed and finally decided to pick up a drill press this week. 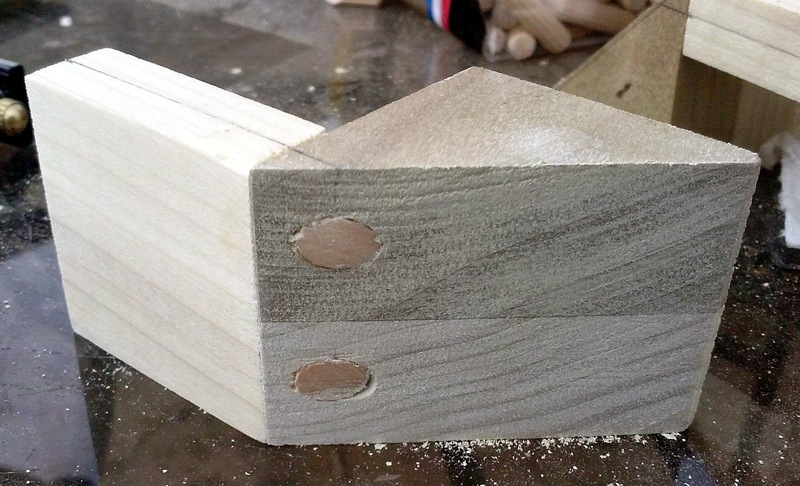 The glue joint on the prototypes between the angle block and the back piece is just not strong enough on its own. I managed to break two of them apart this week. The smallest "pins" I could find were 1/4" and since the back piece is only 1/2" wide its going to take some precision drilling, through a 45 degree angle no less, to make this all come together. 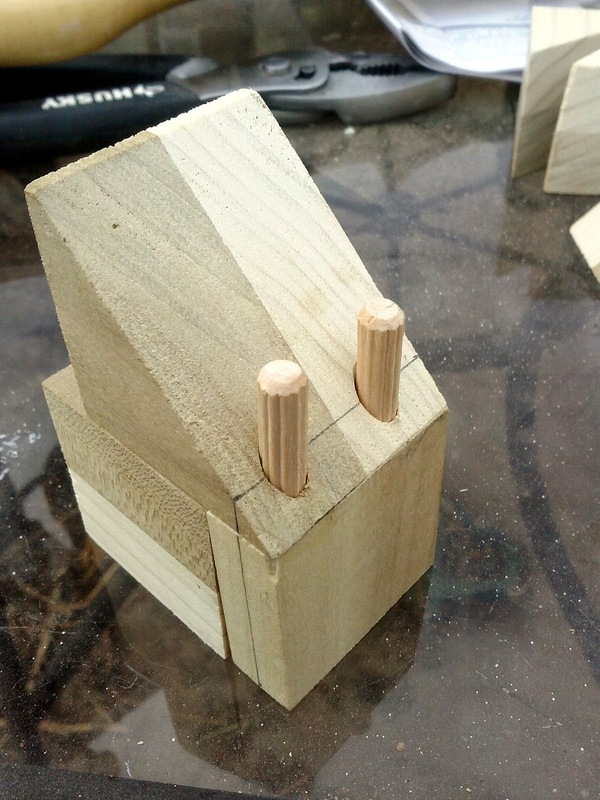 While I could make my own pegs at what ever width I desire there is a point where the peg itself wouldn't be strong enough and I want to be able to buy off the shelf as much as possible. So enter the drill press. I was able to sit down outside this afternoon and enjoy a lovely autumn day and figure out how to make this work. 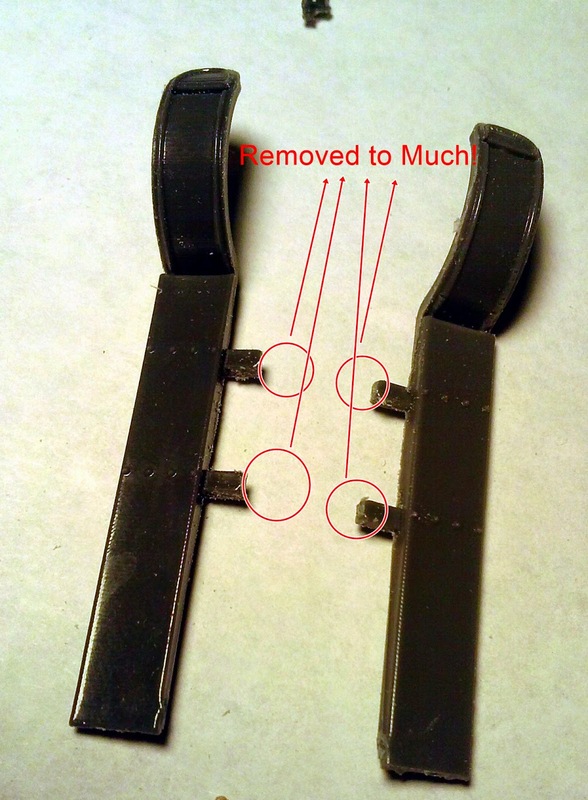 The two that had broken were relatively easy to do, but the two that were still intact and the second side of the other two were going to present some problems. I did one by holding everything by hand and hoping that blocks didn't start spinning out from the drill. That worked but its not the safest and it kind of felt like a game of Jenga. A jig was required. 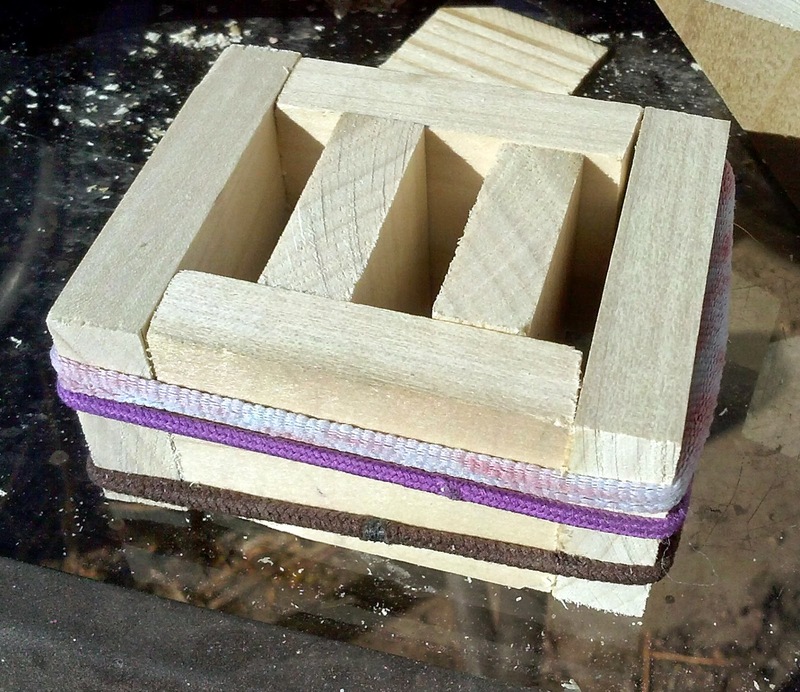 It turned out to be pretty simple, just a little box the right size, a back piece and a 45 degree block and I was set. 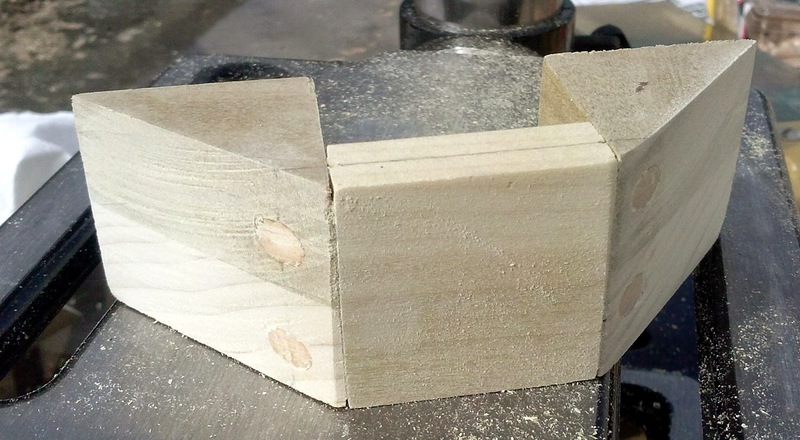 I need to calibrate the miter saw properly though its still cutting a slight angle when I should be getting a vertical cut. 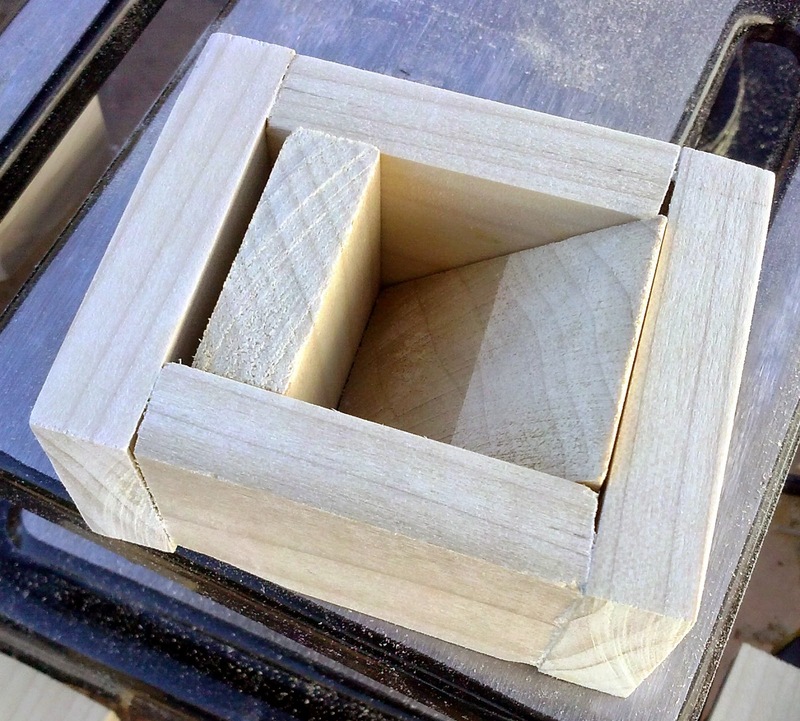 Rather than do that I went brute force and glued the box together and then pegged it as well. Not the prettiest work but it gets the job done and that's all I need it to do. After I drilled and pegged everything I spent some time sanding everything down in preparation for a little finish work. I hit everything again with the 80 grit sandpaper, then followed that up with the 120 grit and finally a shot with the 220 grit. Poplar is a relatively soft hardwood so this only took about an hour to work through. 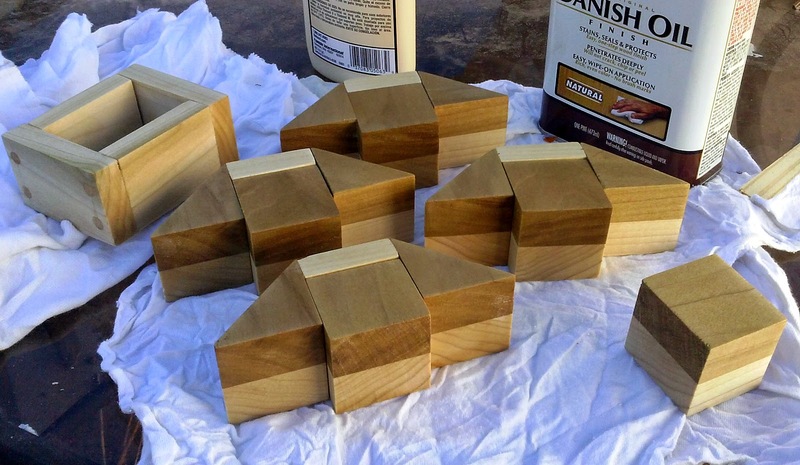 Since my intention is to match woods with the miniature I went with a natural finish rather than a colored stain. I'm quite please with the final result. I still need to figure out what wood to use for the backdrops but I'm closing in actually finishing these and showing them off a bit. I'll definitely be using a couple of the better looking ones for my Genghis Con entries. Here is the photo story for today. Successfully drilled out the first display stand. A good combination square and a mechanical pencil are required tools. 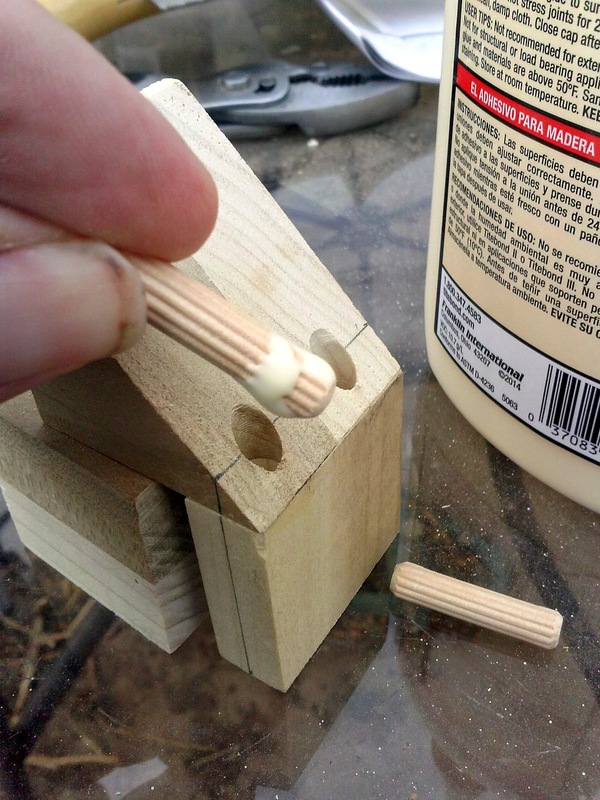 See how much glue is forced out, hence why the peg is fluted to give it someplace to go. 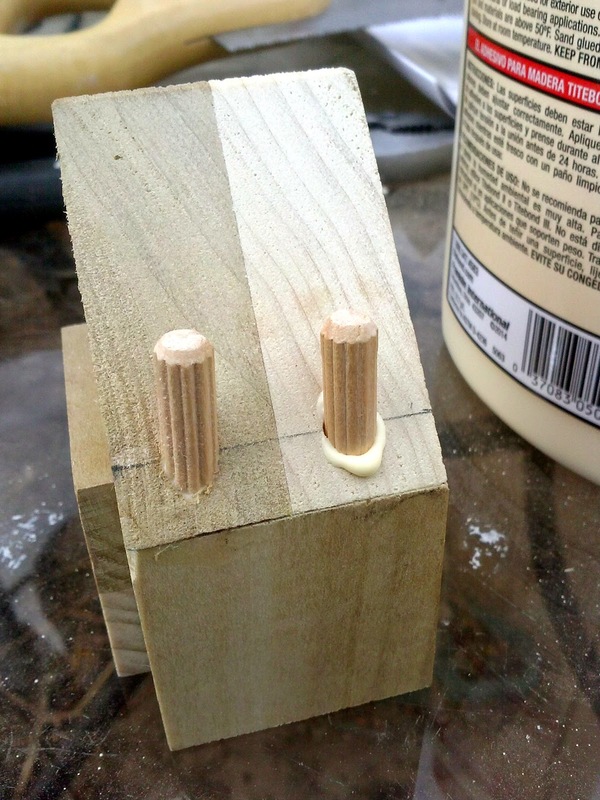 Use a wet cloth or paper towel to wipe up the excess glue. The second peg is in. This should now hold up to just about any abuse you care to dish out at this point. Here one of the display stands that survived the week intact is now pegged from both sides. 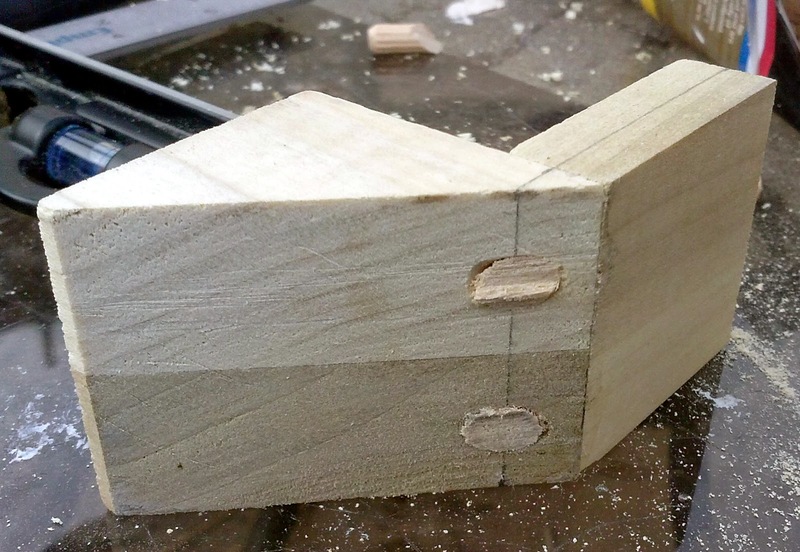 Working on this piece convinced me that I needed some kind of jig to hold everything while I drilled the holes. 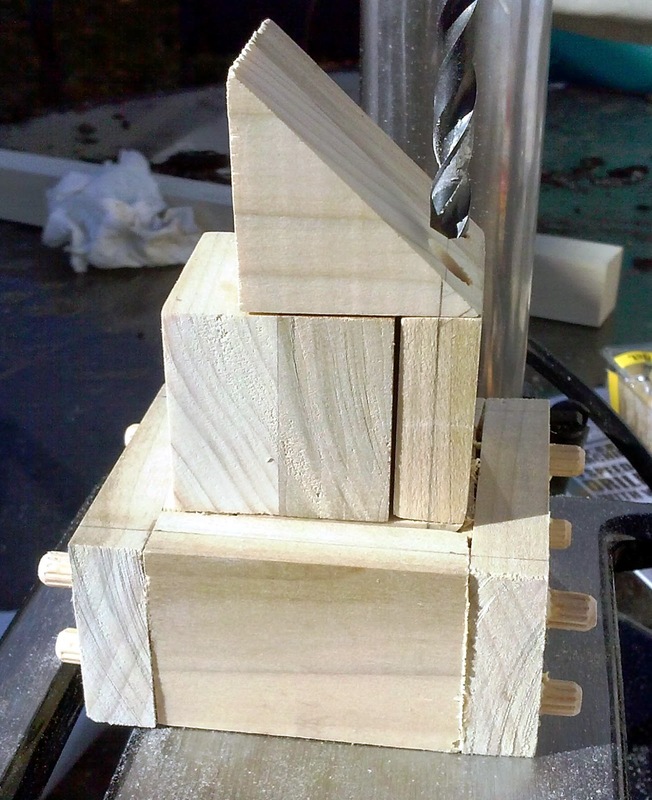 Constructed the jig. I couldn't find any rubber bands so I grabbed some hair bands instead. What goes inside, one of the back pieces and one 45 degree cut block. Works like a charm. Note at this point I hadn't cut the excess pegs from the jig yet. 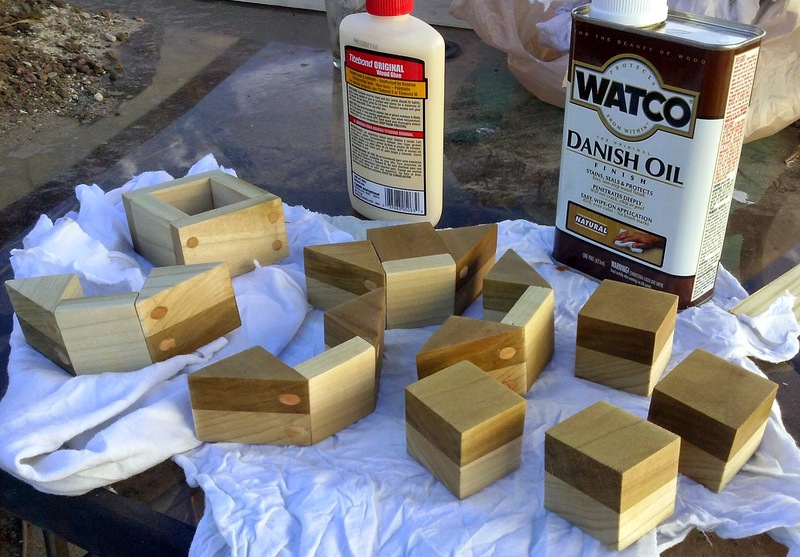 Finishing everything up with a coat of Watco Danish Oil, natural finish. I even did the jig. Since its going to get a lot of use I figured that it would be best if it had a protective finish as well. 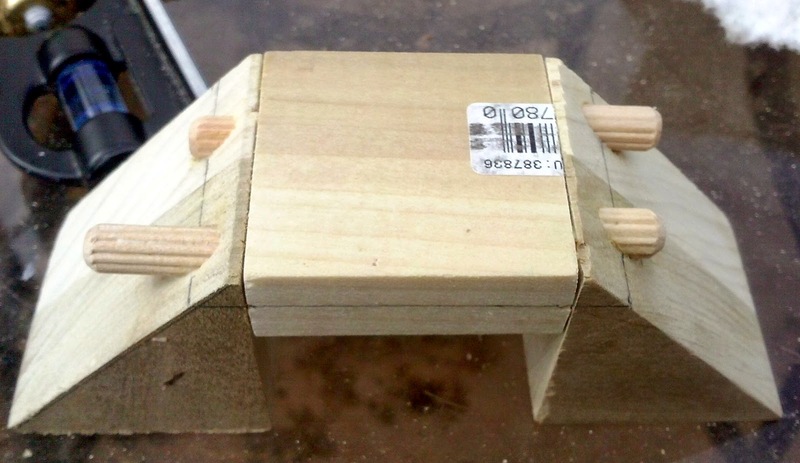 You can clearly see that the pegs are made from a different kind of wood. Since these are on the back side and will be covered by the backdrop I'm not worried about matching woods. And everything put together in the right way. 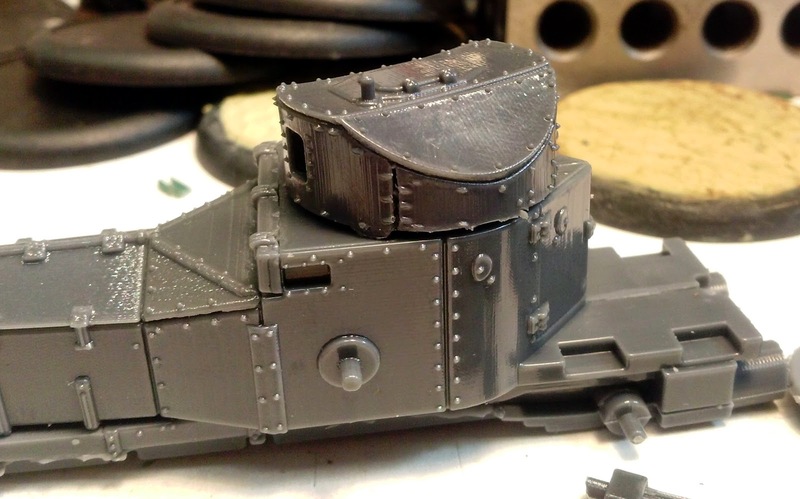 With the Kickstarters I have supported I figure its on time if it delivers within 2-3 months after the estimated delivery date. This one from Trenchworx arrived today, weeks early! It was scheduled for a November delivery (end of November I believe). Granted my order was pretty simply just 3 FT-17 and a Rolls Royce Armored Car, but I'm still very impressed. UPDATE: I received an email from Dave at Trenchworx this morning. He asked about my release agent comment because they don't use any! 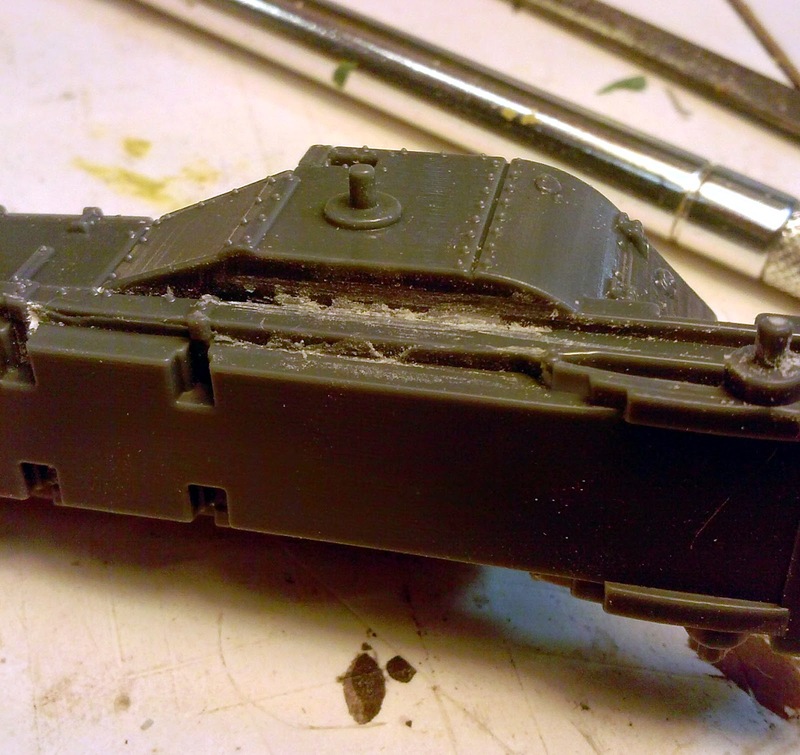 They have been able to prime and paint their models straight from the molds. I went back to where I had layed out the pieces to dry and they still feel quite slick to me. 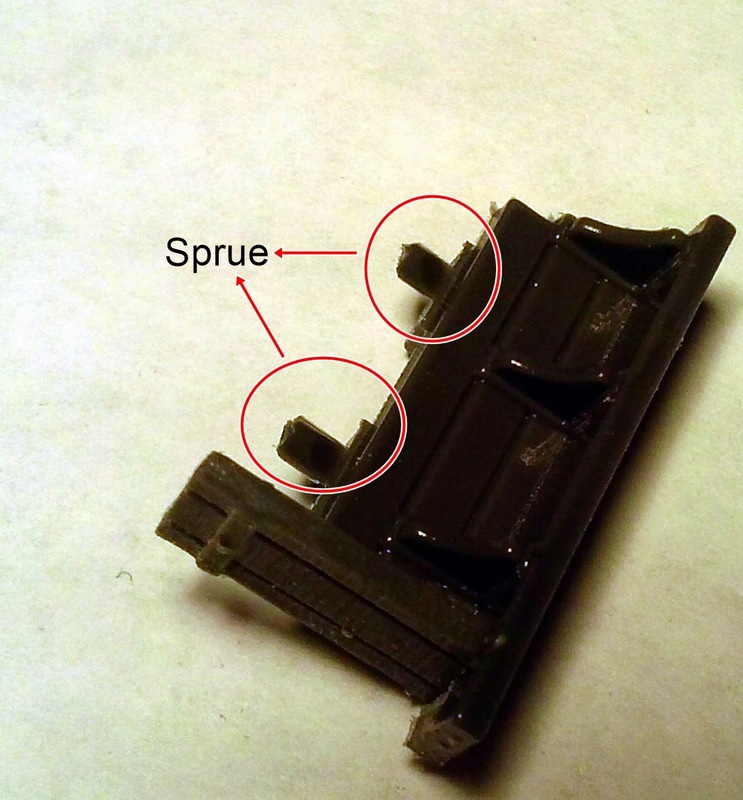 But now I believe that its because their mold process produces such a smooth surface that it feels "slick". 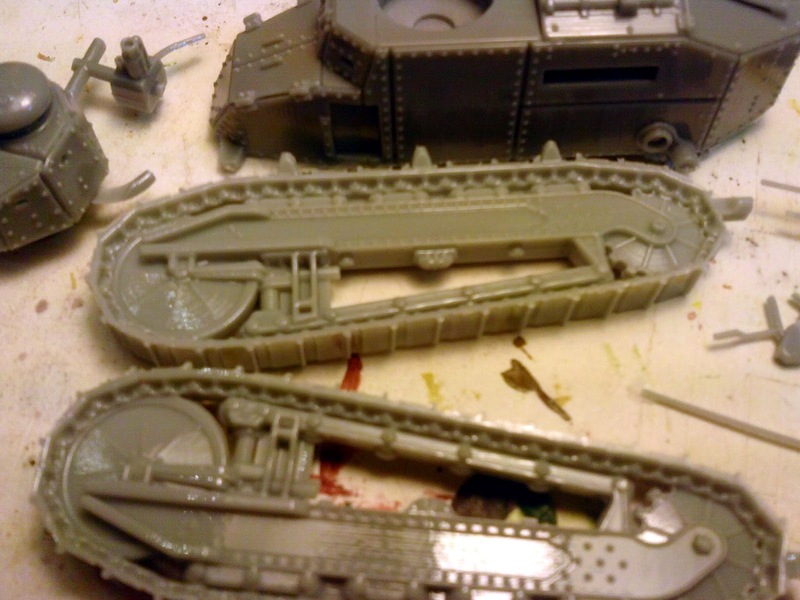 I'm hoping to get some primer on these today but after emailing with Dave I'm not anticipating any problems. These are going to do a great job supporting my WWI US Marines. Somewhere in all this are three tanks and an armored car. 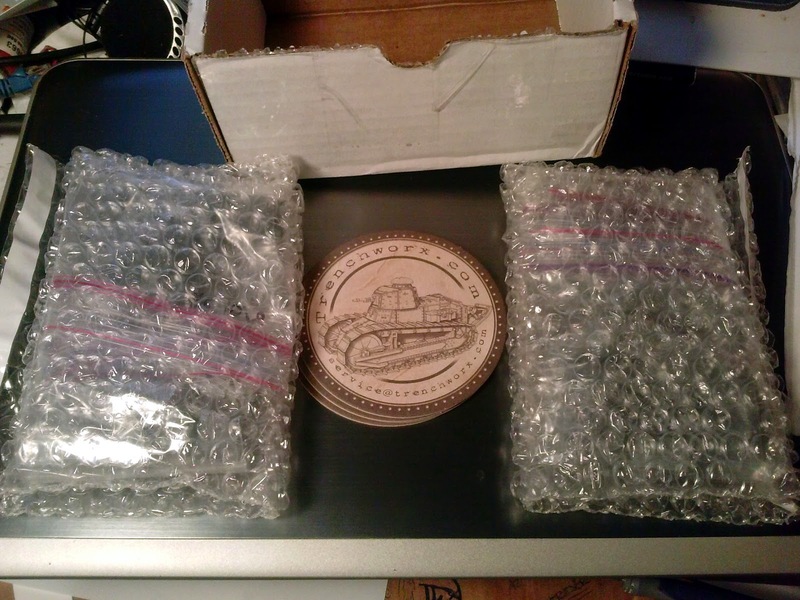 They sent along some coasters as well. There are a few more parts to the FT-17 than I expected. 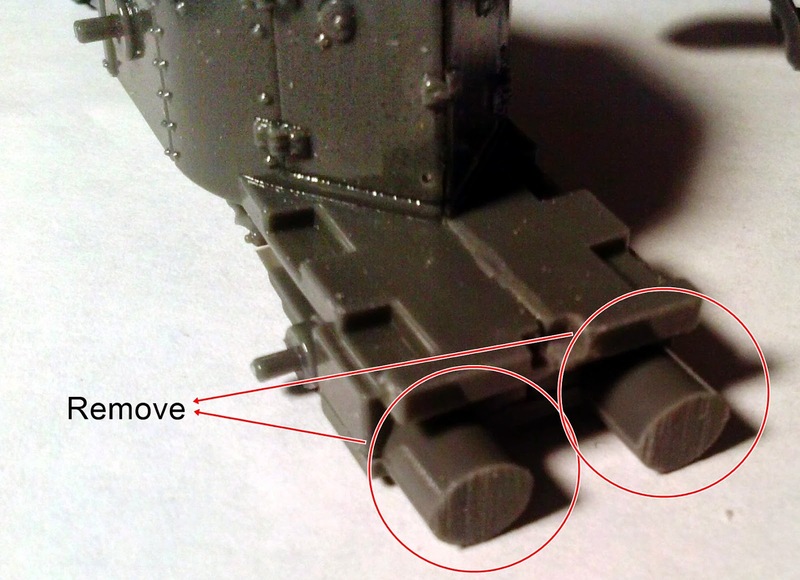 There are also rare earth magnets so I can switch out the weapon between an MG or a 37mm Cannon. 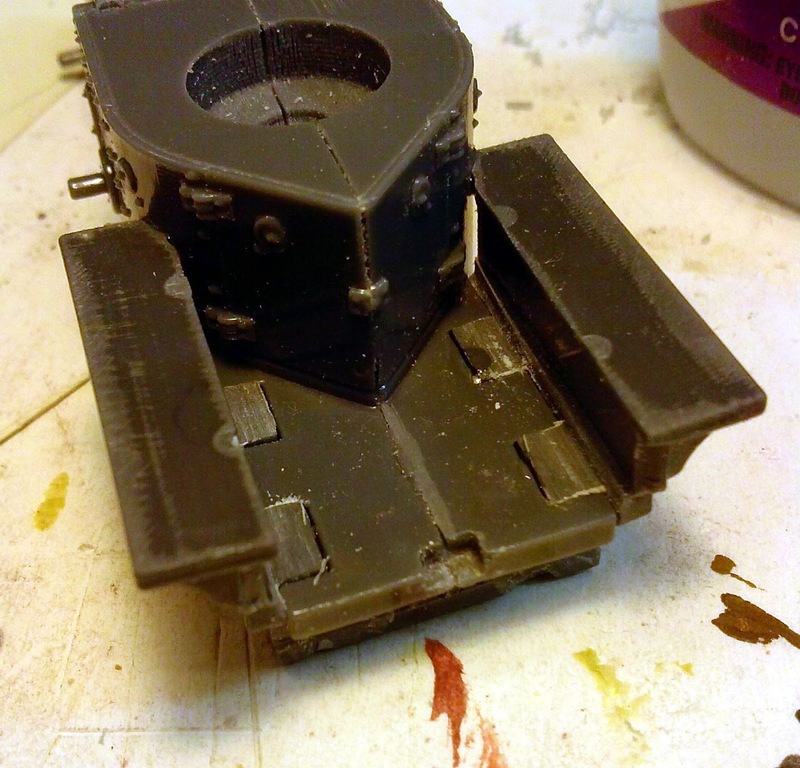 Just dry fitting the turret here.